You know those moments where you’re trying to do something awesome, and right when you get into the groove of things everything starts to break apart and – before you get super annoyed – you leave it alone and go do something else? Well, anyways, perhaps not everyone goes through things like that. I did today, however. I wanted to get a lot more finished with my picture today, but first my Photoshop paint brush cursor went all…. weird. I attempted to fix it in the settings, but it was no use. I likely have to restart. So, I continued on with this little annoyance still occurring and just proceeded to paint as best as I could. Then, the Internet news show I was watching began to skip and buffer. I had my laptop hooked up to my television to watch this show while I still used it to do my art stuff, so I had to switch the video source to my PS4 so I could take a look and see if anything was downloading. Good news, one of my favorite PS3 games, Journey, is now on PS4. So, that’s what was downloading in the background. Then, while I was attempting to get that all sorted out, my laptop was acting all funny since I switched the video source to my PS4. However, before I became frustrated with any of this, I just decided that I did enough work for the day. I should just get this out there on the Internet and be happy that I got as much as I did finished. One I get all this posted, shared, and all that good stuff, then the Journey download should be completed, and I can go right back to watching my nerdy news show. Alright. So for today we have a tie fighter-esque space ship being added to the mix, and the wannabe Death Star doesn’t take up as much room as it once did. This way I have more space (literally) to paint in some of these fighter ships which should hopefully look like they might be coming from a docking bay on the other side of the sorta Death Star. At the moment, that tie fighter actually looks very close to an actual Star Wars tie fighter. That wasn’t really intended, as I would like to stray a bit and add some of my own features. 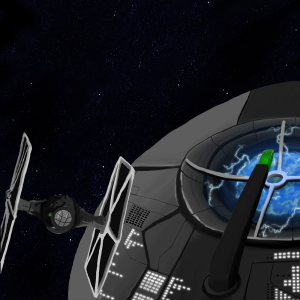 I want it to resemble a tie fighter, but have a look all it’s own. I think I’ll try adding a couple fins to the top and the bottom of the sphere. We’ll see… right now that sounds a little too simple of a change.